This all-in-one preschool art center lets little ones paint side-by-side, while providing plenty of storage for any materials they might need. 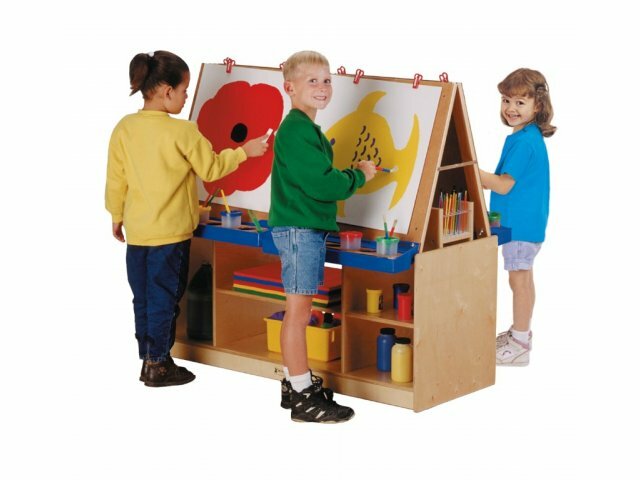 Four magnetic easels give young learners a great space to paint, draw and work on all sorts of projects. Built-in paint trays keep materials close at hand while clips ensure that papers stay in place throughout the project. When choosing an art center for kids, you want to be sure that it is built to last. Sturdy dowel-pin construction prevents weakening at the joints while an ultraviolet acrylic coating ensures a clean shine for the long term. Super strong three-point connection brackets include rubber casters which allow easy transport. 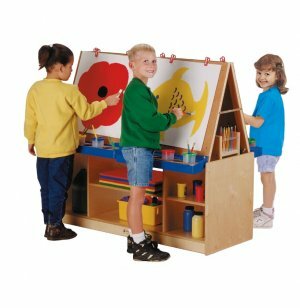 This art station is a great choice for any daycare, preschool or kindergarten. Versatile Surface: Magnetic whiteboard easels can be used for all sorts of activities. Great Storage: Lots of storage space between the easels and in cubbies underneath keeps supplies organized. Smooth Rolling: Three-point connection brackets with hard rubber casters add triangular strength and smooth transport.